This post first appeared on February 8, 2019 in The Industrialist’s Dilemma. 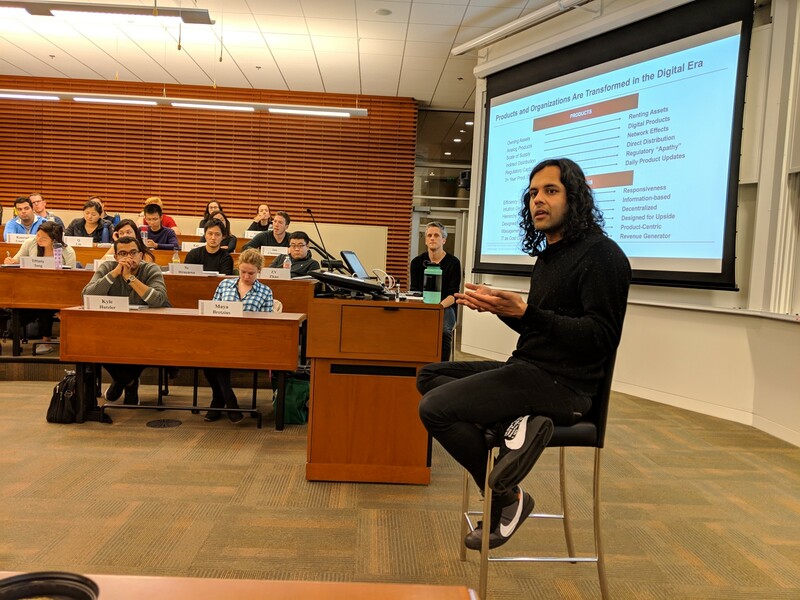 As we prepared for Robinhood’s Co-CEO and Stanford alum, Baiju Bhatt, to visit The Industrialist’s Dilemma, we thought the class session would revolve around how Millennials want to trade stocks for free. We thought this would be a classic case of Christensen’s disruption from the bottom — a new entrant launching a less expensive and initially inferior product compared to existing solutions, and that the company would attempt to grow over time in order to take market share from the incumbents (who offer over-featured solutions and have a higher cost basis than the upstart). We thought this would be a traditional discussion of how a Silicon Valley-based FinTech startup was going to use technology to up-end the way things were being done in the world. It was those things and much, much more. When we asked our students which ones used Robinhood, we expected it to be a substantive part of the class. We found a few students who had used it in the past and a few who were currently using the app. We discovered that the notion of doing something new and for free was what got the students initially engaged, and this likely accounts for Robinhood’s herculean growth to over six million users in the United States. We assumed that a group of Stanford Graduate School of Business students were the company’s ideal target customer base. As has been widely reported, Bhatt and his team were inspired to set up Robinhood in the wake of the Occupy Wall Street protests of 2011. For Bhatt and the Robinhood founding team, their goal was to widen the scope of accessibility of stock ownership to a broader audience of people than those who currently own stocks and get to participate in the economic benefits of equity appreciation. While the hype and excitement of Robinhood’s early success might have attracted the type of young adults that sat in our classroom, the ease-of-use and low transaction cost (free) of conducting a trade actually benefits more strongly those who have not had access to the mainstream financial system in the United States. In some ways, this reminded us of our first session with Anne Wojcicki of 23andMe, where her initial customers (those of who give their saliva to get their DNA sequenced) are not the company’s long-term business model target (selling pharmaceutical drugs to a wider audience of people). In the case of Robinhood, once again we saw a company where the initial customer focus might not be the long-term cohort for this disruptor entering their market. Bhatt stressed that the one of the key things that made Robinhood possible were those technological innovations we identified at the start of our class that make this dilemma different than others: ubiquitous mobile accessibility, widespread innovation on information availability (including both broad information on the workings of financial markets as well as financial information on specific companies) and simplicity enabled by seamless software solutions which reduce barriers to entry and access. As we have seen from visitors from the financial services sector (e.g. Stripe, Charles Schwab and PayPal) to either The Industrialist’s Dilemma or other classes at Stanford, the disruptors usually enter the financial space offering a best-in-class solution on one component of the space (e.g. payments, stock trading, etc.) and over time layer on additional services to meet the broader financial needs of their customers. Stripe started by digitally facilitating online payments and has since moved into helping companies get incorporated, amongst other solutions. Like Robinhood, Charles Schwab started with low-cost stock trading and today offers a virtual cornucopia of financial services from checking accounts to mortgages. Given some of Robinhood’s recent activities, we see that they, too, are working from a similar playbook, and we know they will attempt to use their market entrance point to expand and offer other products to their customers given some of their other actions to date. What caught our attention, however, is that if we accept Bhatt’s assertion that what Robinhood is doing is democratizing stock trading to an even greater extent than it has been done previously, and that the value they are bringing is to those who have historically been outside of the highly-serviced and high-end financial industry, Robinhood may be uniquely positioned to leverage technology to bring financial advantages to a very large and under-served segment of the United States (and even global) population to gain economic benefits previously not attainable. And that segment may not be Stanford graduate students even if they might have been some of Robinhood’s initial customers. At one point during the Q&A with the students, Bhatt was asked about Robinhood’s responsibility in teaching financial literacy to their customers — the implicit criticism that the company could either intentionally or unintentionally create moral hazard for individuals who may not understand the risks of investing in the market. While Bhatt talked about those places in Robinhood’s product where customers can get educated on financial issues, and while he also talked about how widely available this information is versus the past, he also responded with a full-throated defense of the intelligence of people to understand the basics of their own financial well-being. As opposed to having to “protect customers from themselves,” Bhatt passionately shared about how new customers come onto their platform and buy products and brands that they know — not esoteric and opaque financial instruments or companies that are not widely known. He highlighted that it is ironic that the most successful companies in the world go public, and in so doing, go from a concentrated ownership base to a wide one with shareholders that range from institutions to individuals. If the world’s largest and most successful companies can act (with government support) to have a broad base of investors, shouldn’t all investors have the tools to participate in financial markets? Upon reflection, it struck me that the founding of Robinhood, which was inspired by anger at the excesses of the financial services which led to the Occupy Wall Street movement, had morphed directly into a message of optimism and empowerment for an individual’s ability to manage his/her own financial well-being and to participate in the economic benefits of a well-functioning financial system. And the ability to make this happen is enabled by both the trends we identified at the beginning of The Industrialist’s Dilemma and a strategy driven by Christensen’s classic theories of disruption. In the last four years of doing this class, this may have been my favorite session for showing the unbridled optimism and possibility of these digital changes, and the good that these disruptions have the potential to bring to the world.